Carbon dioxide is naturally produced in our body, and is switched with oxygen as we breathe in. It is then expelled from the body as we exhale. Though many people do not struggle with removing CO2 from their body, some individuals can have a hard time removing CO2. When carbon dioxide isn’t removed from your body it is left in your bloodstream and you can develop hypercapnia. You may feel like you have to gasp for air or suddenly inhale a lot of air in order to maintain CO2 and oxygen levels in the body. But these symptoms may not always be a cause for concern, as you may breathe differently depending on how you are positioned (while sitting, laying down, standing, etc). There are a handful of medical conditions that can be the cause of hypercapnia. When inhaling, we exchange the oxygen we have breathed in with the carbon dioxide out body is getting rid of, this occurs in the alveoli. Those with COPD have difficulty exchanging oxygen and carbon dioxide as the alveoli in the lungs are damaged. There is then less surface area in the lungs to exchange gases. Not only can this cause hypercapnia, but it can cause hypoxemia. Hypoxemia is when there is a low level of oxygen in the blood, which could damage organs if it remains low for too long. Retention of CO2 occurs in those with COPD due to the poor exchanging of gases in the lungs. This should not be alarming for those with COPD, as not everyone with COPD will developing hypercapnia. Besides COPD, there are a handful of other lung diseases that can cause hypercapnia. 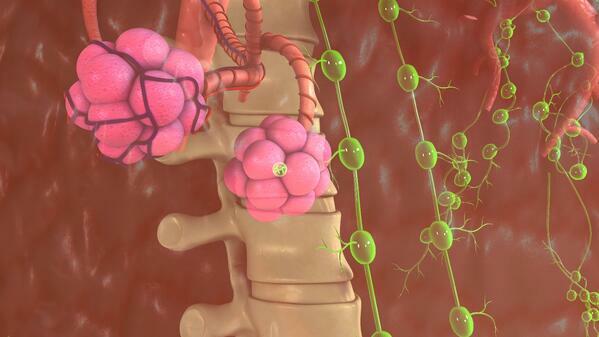 Many other lung diseases that can cause damage to the alveoli are at a higher risk of developing hypercapnia. Diseases and illnesses such as pneumonia, emphysema, pulmonary edema and lung cancer are all at a higher risk of developing hypercapnia. With degenerative neurological conditions, it can cause damage to the brain which can result in poor response in increasing breathing. When brain function is working normally, your body sends a signal to the brain to increase breathing rates to increase oxygen intake and decrease carbon dioxide in the body. If there is neurological damage to the brain the brain may not receive or send these signals to the lungs. Respiratory depression can be caused by an overdose of narcotics, specifically opioids. Opioids effect the part of the brain that controls and regulates breathing. If a high enough dose of an opioid is taken, there is a risk for respiratory depression and possibly even death. Due to the connection of opioids and respiratory depression, there is a high level of fatal drug overdoses by opioids. Some conditions (that you may not be aware of) can cause “dead” space in the body, meaning that of all the air you breathe in, some of it may not be used. If this occurs, it often means that the respiratory system is not working correctly, and the lungs are not exchanging oxygen and CO2 correctly. Nerve and muscle conditions can lead to hypercapnia, as the nerves and muscles associated with lung function may not be working correctly. It is possible that a disease can cause weakness in the nerves and muscles of the body, preventing them from working properly. Genetic conditions such as alpha-1-antitrypsin, which does not produce enough protein, can cause hypercapnia. The protein produced in the liver helps keep the body and lungs healthy, but if there is not enough protein produced it can lead to damage of the alveoli in the lungs. There are a few other things that may cause hypercapnia, such as sleep apnea, obesity, scuba diving, and ventilation during anesthesia. Sleep apnea can cause hypercapnia as you are not breathing properly while sleeping, which can result in low oxygen levels and high levels of CO2. Obesity can also be a cause of hypercapnia, as your body may not get enough oxygen it needs with too much weight pressing on the lungs. Scuba diving and ventilation during anesthesia are both possible causes of hypercapnia, as it can limit the amount of fresh air you receive. If you are put on ventilation during anesthesia, there is a risk of incorrect settings, which can cause hypercapnia if not corrected. Other things that may cause too much CO2 (having a fever, eating too many carbs) occur when the body naturally produces more CO2, which can reside in the bloodstream. You may notice symptoms of hypercapnia, but if not, it may be caught during your yearly checkup. An arterial blood gas test may be done, as it can check levels of oxygen and CO2 in your blood to make sure all levels are abnormal. Other forms of diagnosis may include a spirometry test, which measures how much oxygen your lungs can hold as well as how much force you use when exhaling. X-rays and CT scans can also help diagnose a condition that may cause hypercapnia, such as emphysema or COPD. Depending on the severity of the hypercapnia, it will help your doctor determine the treatment plan. If another condition is causing your hypercapnia, your doctor will often want to focus on the underlying condition first. Surgery: Often a last resort, surgery can treat damaged airways, remove damaged tissues, or remove a lung altogether. You should have a yearly exam with your doctor just to make sure you are okay, and possibly catch a disease or illness early. If you notice that you are a bit off compared to normal, give your doctor a call. Any symptoms, such as fatigue (more than normal), lack of concentration or increased confusion, muscle twitching or heart palpitations deems a doctor’s appointment. Your doctor will ask you a handful of questions and will most likely preform tests to narrow down the possible diagnosis’. Even if you feel slightly off and cannot put your finger on why, make sure to give your doctor a call, as it is better to be safe than sorry. 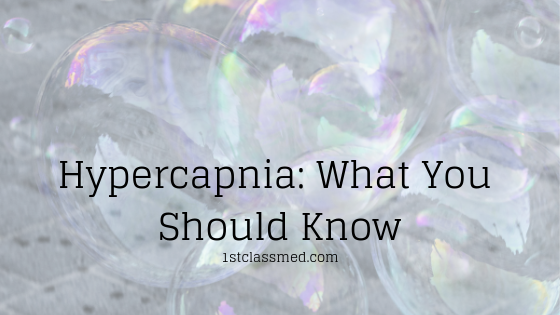 Hypercapnia can be dangerous if it isn't caught in time, so it is key to know symptoms and risk factors.